Opposition leader Juan Guaidó appeals to party and supporters to up pressure on embattled President Nicolás Maduro to call early elections. Opposition leader Juan Guaidó appealed to his countrymen to take to the streets at the weekend for "the biggest march in the history of Venezuela" in a new bid to up pressure on embattled President Nicolás Maduro to call early elections. Major European countries have set a weekend deadline for Maduro to call such elections or they will join the United States in recognising Guaidó, the speaker of the national assembly, as Venezuela's interim president. "We must all take to the streets of Venezuela and the world with a clear goal: to accompany the ultimatum given by members of the European Union," Guaidó said Thursday. "We are going to stage the biggest march in the history of Venezuela and our continent," he added. He called the rally to coincide with one convened by government supporters to mark the 20th anniversary of the socialist movement founded by the late Hugo Chávez. The opposition leader also said he will defy a government ban on humanitarian aid by sending large convoys of medicine into the country with the help of neighbouring nations. In an interview Thursday, Guaidó told The Associated Press that the move will be a "new test" for Venezuela's military, whose top brass has sided with Maduro since protests against his rule broke out last week. "In a few weeks they will have to choose if they let much needed aid into the country or if they side with Nicolás Maduro," said Guaidó, who recently offered an amnesty to members of the military in another effort to encourage them to defect from the Maduro administration. He explained that aid for Venezuela will include life-saving medicines that are scarce in Venezuela and will be transported by vehicles arriving at several border points, after it is shipped into "friendly ports" in neighbouring countries. Guaidó said that he is still sees transparent elections as the best way out of Venezuela's spiralling political crisis, but realizes that Maduro will not easily grant them unless he is pressured to do so by economic sanctions, street protests and Venezuela's military. “Our message to our military and other officials is very clear: we do not want them to support a political party or a side. We only urge them to comply with and enforce the Constitution. Their loyalty is not to an individual but to the nation that has entrusted them with the weapons to defend it,” Guaidó said in an exclusive interview with an Argentine journalist from Clarín. Guaidó's claim to the Venezuelan presidency has been backed by protests in which at least 35 people have been killed and more than 900 have been arrested, according to human rights groups. He told Clarín that he is fighting for his entire country. “It is not about me, it is a struggle of the whole Venezuelan society to recover its democracy and freedom,” Guaidó said. While marshalling international support, Guaidó is seeking to maintain street pressure against Maduro. 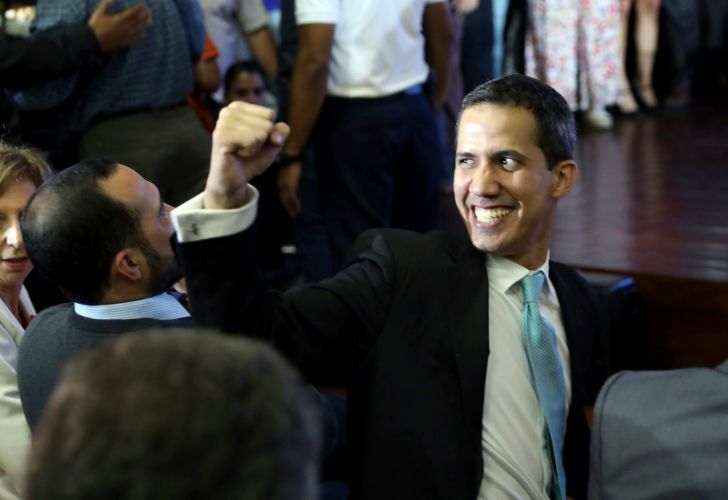 On Thursday, lawmakers at the European Parliament voted to accept Guaidó as "legitimate interim president of the country" – and urged the European Union to follow suit. Four major European powers – Britain, France, Germany and Spain – have said they would do so if Maduro fails to call presidential elections by the weekend. The US on Thursday urged all European countries to recognise Guaidó, but Maduro has told the "imperialists" to wait until 2025 for new elections. Guaidó was at the main Caracas university to present his "rescue plan" for a country in economic meltdown. "We are going to address the humanitarian emergency, stop inflation in its tracks, reactivate the oil industry and move towards the restoration of access to public goods and services," he said to cheers. Part of the plan unveiled by the opposition leader and his economic advisor José Guerra is to end exchange controls in force since 2003 and renegotiate Venezuela's estimated US$150 billion debt. Guaidó wrote in a New York Times op-ed published on Wednesday that "clandestine meetings" had been held with members of the Armed Forces and Security Forces, who he is trying to woo with an amnesty offer. But Guaidó's moves to court the military are fraught with risk. Last week fewer than 30 soldiers rose up against Maduro, precipitating protests that, according to the United Nations, ended with more than 40 dead and hundreds detained. The last 10 days of political upheaval have exacerbated the general disarray in Venezuela, which has the world's largest proven oil reserves but has suffered hyperinflation and shortages of basic necessities.